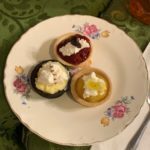 Cuthbert’s Tea Shoppe is the place where visitors to Winter Fest OC can come and enjoy a nice pot of tea, scones, tea sandwiches and delightful desserts in the midst of the hustle and bustle of Victorian London. We are offering online reservations so patrons of the Winter Fest OC can make a reservation for tea in advance of their visit. 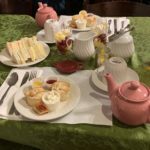 Patrons do not need reservations to enjoy tea, but without them, there is a possibility that they may not get in to the shoppe due to its popularity. 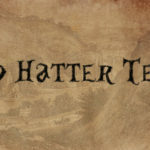 Each day (except 12/20) there will be a Mad Hatter Tea at 2:30, featuring visits from Alice and her Wonderland companions. At 4:00 and 6:30 we offer High Tea, which includes a serenade by Carolers and a teapot to take home (On 12/20, there will only be one High Tea at 7:30. On 12/31, there will be an additional seating for High Tea at 11:00PM). Price for the Mad Hatter Tea and High Tea is $27 per person for adults and $13.50 for children, 12 and under. At 8:00 there is a dessert tea including scones and the dessert of your choice. Price for the dessert tea is $15.00 per person. For full menus, please click here. Reservations may also be made at the Dickens Village at WinterFest OC on the same day as your visit by coming to the shoppe and checking with the hostess to see if there is space available.